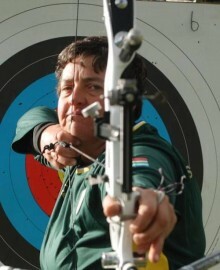 Karen Hultzer, who is taking part in the London Olympics as an archer for South Africa, has made her first public statement regarding her sexuality to online LGBT sports blog OutSports.com. Last week, when Huffington Post Gay Voices published a story about the gay Olympians competing in London, we received a tip from a reader notifying us of a comment Hultzer’s partner made to South African gay lifestyle website, MambaOnline. Posted August 1st, 2012 & filed under News, Sports.